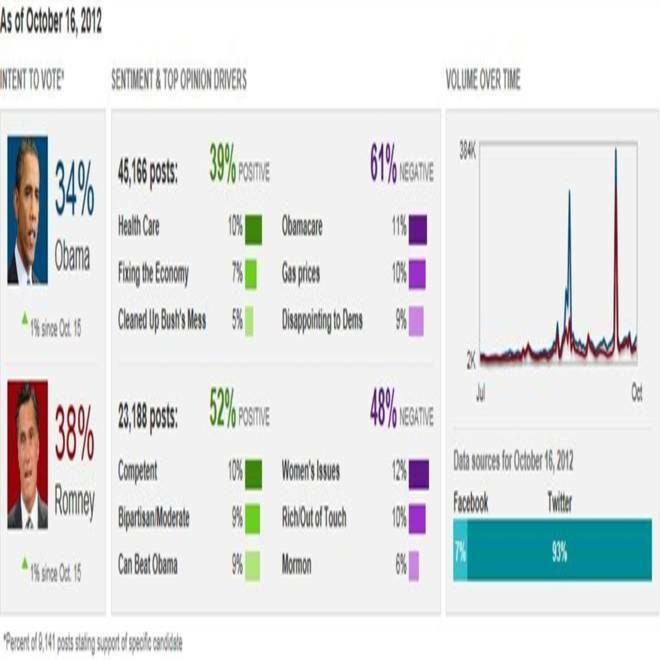 Social media campaign sentiment for Tuesday, Oct. 16, most of it before Tuesday night's debate. Click the image for the full version. President Barack Obama eclipsed former Massachusetts Gov. Mitt Romney in the second presidential debate Tuesday night, commanding the stage in a manner that many people found a reassuring contrast to his performance in their first debate, according to NBC Politics' computer-assisted analysis of more than 1 million debate comments on Twitter and Facebook. That works out to a 58 percent to 42 percent edge for Obama among commenters who expressed a clear opinion. NBC Politics reviewed 1.05 million posts on Twitter and Facebook through noon ET using a tool called ForSight, a data platform developed by Crimson Hexagon Inc., which many research and business organizations have adopted to gauge public opinion in new media. It isn't the same as a traditional survey, which seeks to reflect national opinion; instead, it's a broad, non-predictive snapshot of what's being said by Americans who follow politics and are active on Facebook, Twitter or both at a particular moment in time, and why they're saying it. Explainer: Can you scientifically quantify social media opinion?